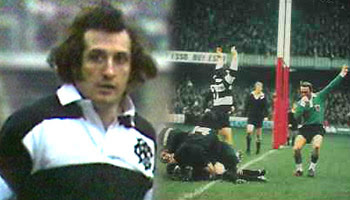 The Barbarians and the All Blacks met at Cardiff in 1973 and the match produced a moment that will never be forgotten. That moment, one of the most played clips on television, came right at the start, when after just four minutes Gareth Edwards scored one of the best tries ever recorded on film. "Kirkpatrick to Williams. This is great stuff. Phil Bennett covering, chased by Alistair Scown. Brilliant! Oh, that's brilliant! John Williams, Pullin, John Dawes. Great dummy! David, Tom David, the half-way line. Brilliant by Quinnell. This is Gareth Edwards. A dramatic start. What a score!" "The game against the All Blacks is one I will never forget and those of us who played in it will never be allowed to forget"
It was the Welsh half-back pair of Phil Bennett and Gareth Edwards that started and finished the move. Gareth remembers the day vividly. "The game against the All Blacks is one I will never forget and those of us who played in it will never be allowed to forget. It is a match that will live with me forever. 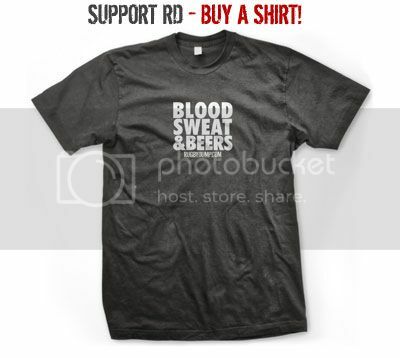 "People tend only to remember the first four minutes of the game because of the try, but what they forgot is the great deal of good rugby played afterwards, much of which came from the All Blacks. "After the success of the 1971 Lions tour, which captured the imagination of the whole country, it was an opportunity to bring a lot of that side together again." This try is widely regarded as one of the greatest tries of all time. This try sums uo what the Barbarians are about. Of course that team had quite a few players with the most outrageous sidesteps ever in rugby. the best bit about it is the pace from edwards at the end!! jst explodeds and leaves the NZ cover defence for dead and the best bit of it all most of them were welsh!!!!! awesum try!!!! IIRC 7 of that team were Welsh (yes, I did watch the match live). JPR Williams (Full back), John Bevan (wing), Gareth Edwards & Phil Bennett (half-backs), John Dawes (capt, centre), Tom David (flanker), Derek Quinnell (lock). Wing: David Duckham; Centre: Mike Gibson; Flanker: Fergus Slattery. The only game I ever watched which came close to that in quality and excitement was France v NZ, 1999. Sheer class. I know a welshman who saw this game live, said it was one of the best games he's ever seen in his lifetime. Greatest try in the history of the game, appropriately finished by the greatest scrum half, and player, to play it. I don't know if that try could be scored today as there were at least 2 high tackles in the run up to the game. If the ref didn't see them, the TJs would have and as they are miked up now, he probably would have stopped the game. Glad he didn't though! Bennett's sidesteps were awesome, jules - did you notice both high tackles were on jpr?